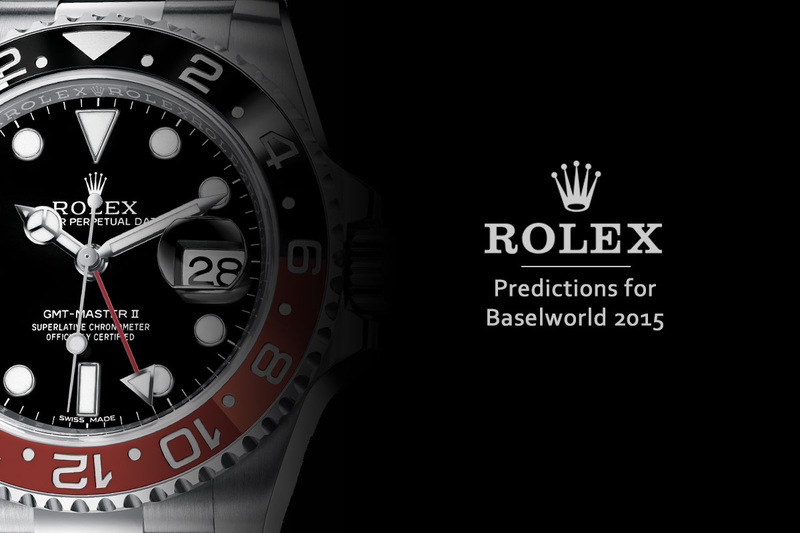 The MONOCHROME team delivers its yearly forecast on the potential novelties that Rolex could unveil at Baselworld 2019. Yes… It’s that time of the year again. Baselworld 2019 is fast approaching with new collections waiting in the wings. 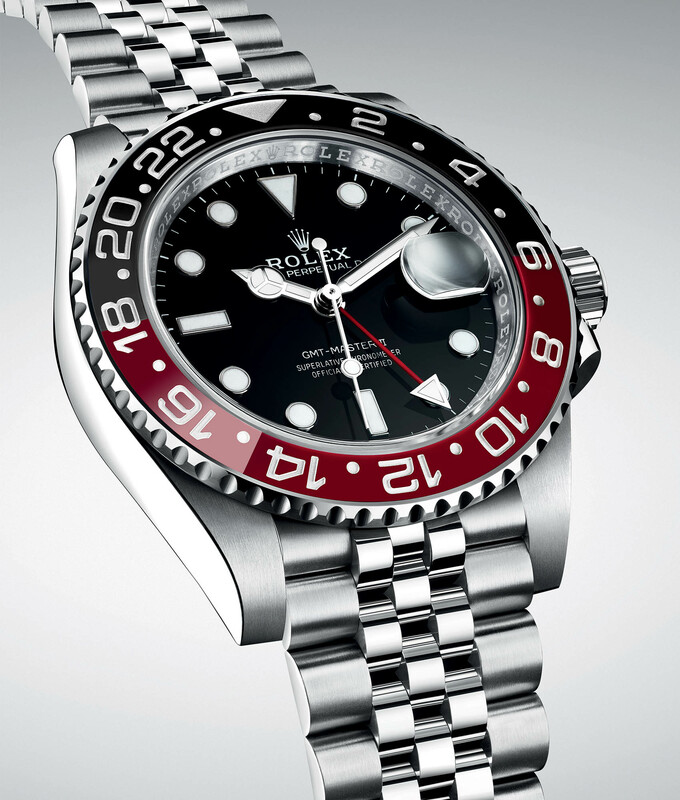 And as usual, the most anticipated novelties of the year will be the new Rolex watches. This also means that it’s time for MONOCHROME to make our yearly predictions and get creative. Just like we did in 2014, 2015, 2016, 2017 and in 2018, we have spent quite some time on the drawing board trying to guess and design what the Rolex Baselworld 2019 Collection might be like. And here are the watches that we think Rolex could potentially launch at Baselworld 2019. Please note that this article is a figment of our imagination. These are just predictions. Nothing is official. It is based on our own expectations and analysis. 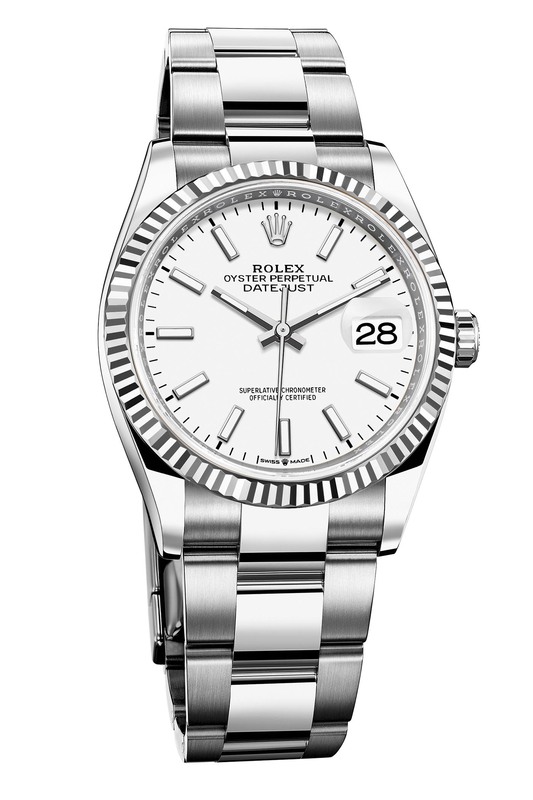 Guessing what Rolex will introduce for its new collection has become a tradition for us, here at MONOCHROME. We won’t hide the fact that we have good fun discussing, predicting and designing these potential novelties – not to mention that we’re even rather proud of some of the watches (even though some will remain dreams). What has changed and made our lives more difficult is the fact that Rolex has become slightly less predictable. For instance, the Daytona Steel/Ceramic was a watch we wished for but didn’t really expect to see in reality. The same goes for the GMT Master II Pepsi in steel, with a Jubilee bracelet. 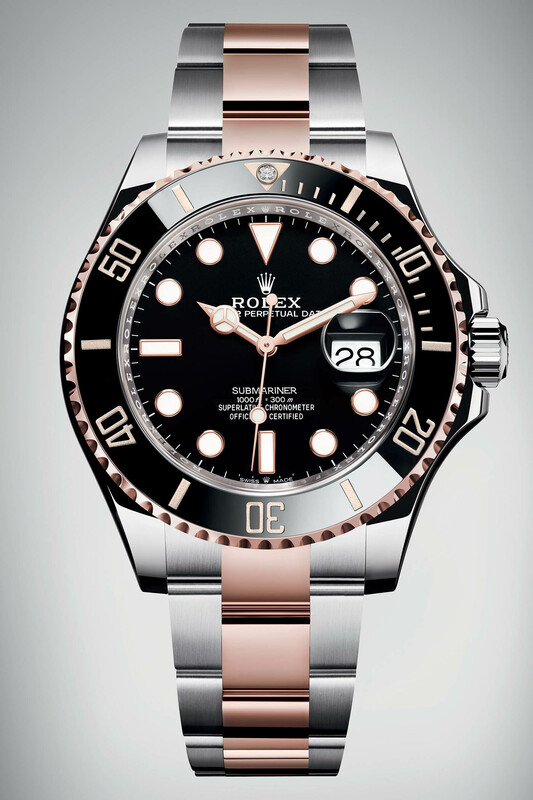 It seems that Rolex has adopted a less conservative approach with pieces like the Sea-Dweller 126600 with its large case, its red line of text and the controversial cyclops lens on the date, or the totally unpredictable Air King with a colourful dial. However, there are some things that remain steadfast, whatever happens at Rolex. For instance, new watches unveiled in gold or two-tone one year are followed by full steel models the year after. With this in mind, guessing what Rolex has up its sleeve has become trickier but a lot more fun too… It allows us to be more creative and to design bolder pieces. But let’s end that introduction and move on to the main topic: our predictions for the Rolex Baselworld 2019 novelties, the watches that Rolex could launch as part of its 2019 collection. Most of the professional/steel watches in the current Rolex collection have been redesigned recently – or at least they have received some updates. 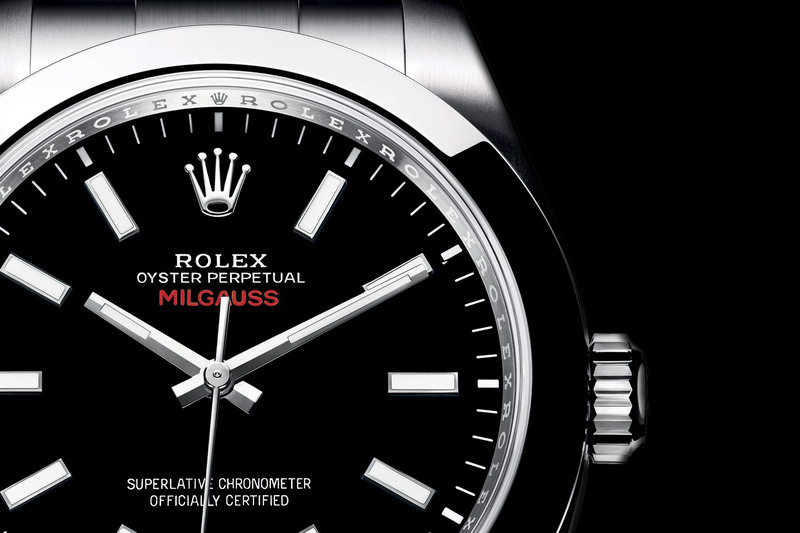 There is one model, however, that has been in the collection without modifications for too long: the Milgauss. This is why we believe that the main Rolex Baselworld 2019 novelty could be a new, redesigned, re-thought Milgauss. What are the reasons behind this prediction? Multiple factors have to be considered. First is the general interest for anti-magnetic watches – and we know that Rolex is running slightly behind on this subject compared to Omega, for instance. It would make sense for Rolex to get back in the anti-magnetic race with a watch that is still named Milgauss, but with higher resistance to magnetism than its current 1000 gauss. Secondly, with the introduction of the new 32xx generation of movements, Rolex has also improved its production of amagnetic parts and updating the Milgauss would make a lot of sense. Finally, this watch has been heavily advertised by the brand recently, which could be a sign of things to come. This is why we’ve envisioned a brand new version of the Milgauss, with a case that is coherent with the rest of the collection – less shiny, more tapered – and with a dial that is a tribute to the beautiful ref. 1019. 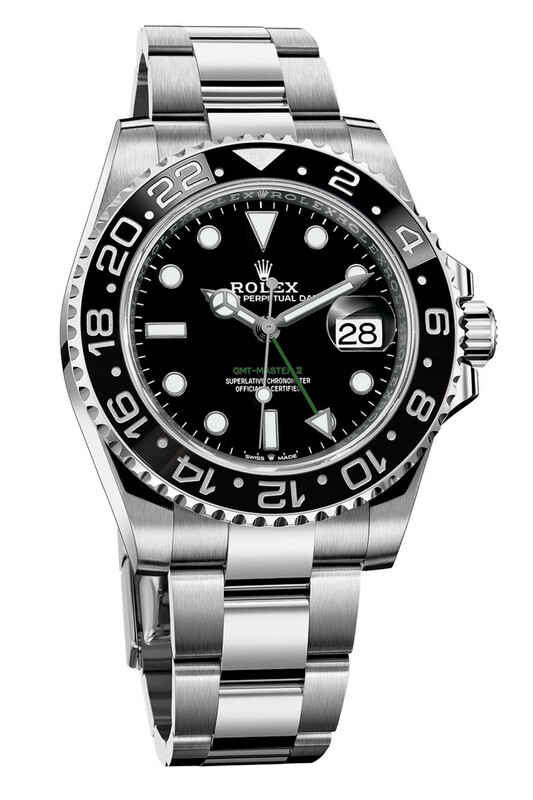 We don’t expect Rolex to reintroduce a rotating bezel on this model, however. The main question is: will Rolex get rid of the soft-iron cage and offer a slimmer watch with an amagnetic movement instead of relying on an external (and heavy) protection? 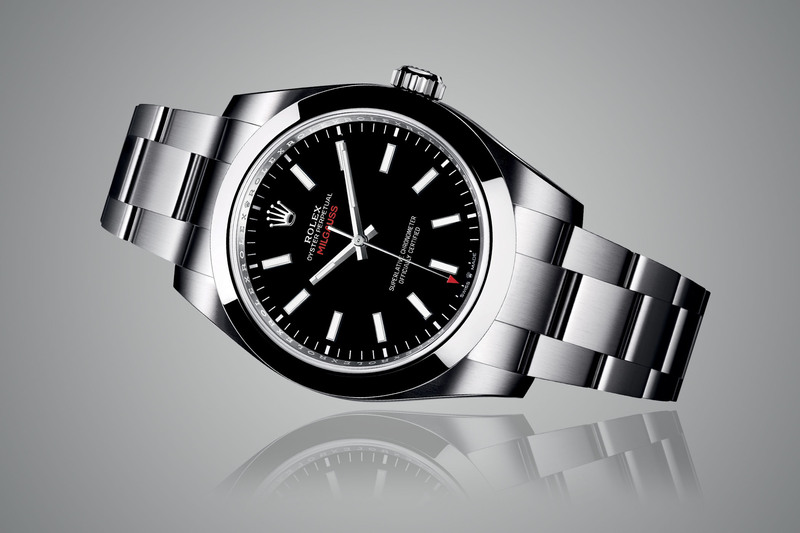 In any case, our imaginary Baselworld 2019 Rolex Milgauss 126400 looks quite stunning, don’t you think? Let’s face it. Luxury watch brands are not really good at creating ladies’ watches – or at least, not good at creating watches for modern, younger ladies. Gone are the days of the small, girly, diamond-paved dress watch. Younger women wear sports watches, dive watches and larger watches too. It is time for Rolex to answer their expectations – which is why we’ve imagined a new size for the Sub. Meet our Baselworld 2019 Rolex Submariner 36. Certainly, this could be a drastic change of strategy for this model, which has always been offered in men’s sizes only since its introduction in 1953. However, believe us, there’s a massive demand for a smaller Submariner, and not just from women. 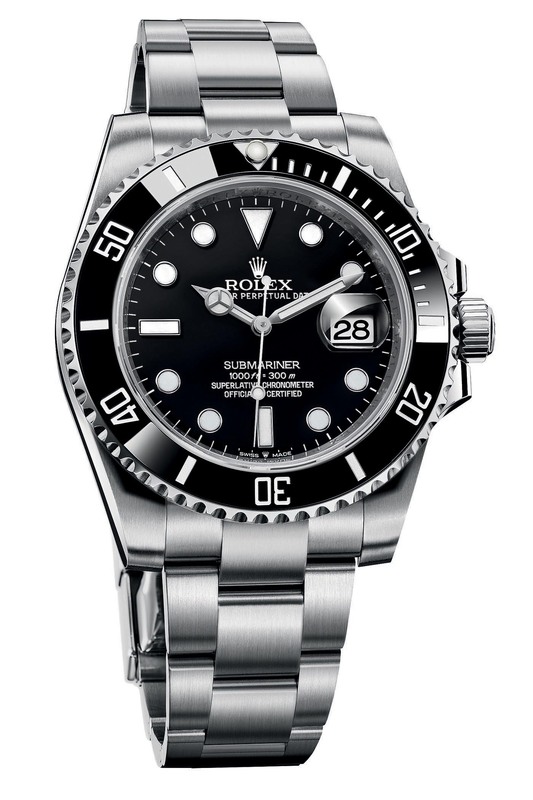 Some markets would love to see Rolex introducing a 36mm Submariner. What we have created here is a slightly redesigned version of the Submariner, a bit less “tool-ish”, with a more luxurious appeal – but still the same diving capacities. The case is less bulky but the bezel and the dial are still focused on the essential – and in this context, the date window makes sense. Of course, the new calibre 3235 would be part of the package. We have dreamed up three different versions. One slightly feminine model with a Rolesor Everose case (combination of steel and rose gold) and a small diamond in the triangle on the bezel. The two other editions are steel models, one with diamond indexes and one with a classic Submariner look in steel with a black dial – and we bet the latter would be a hit in stores. 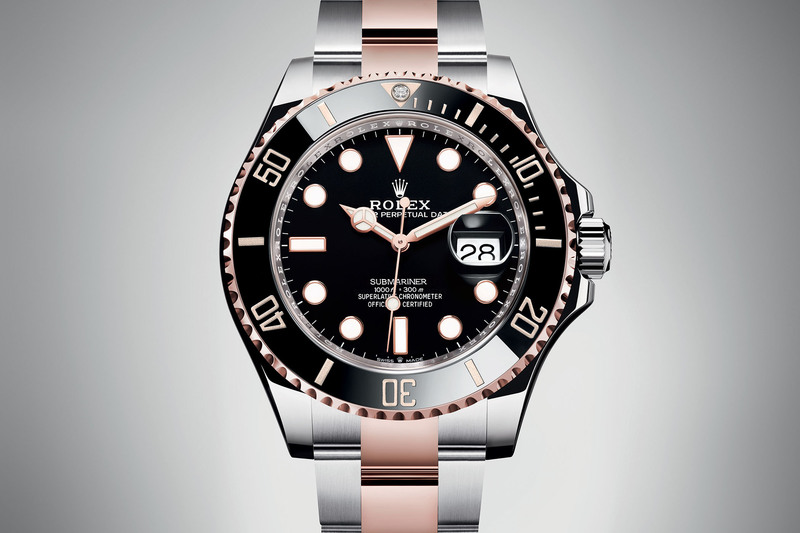 What do you think of our Baselworld 2019 Rolex Submariner 36? 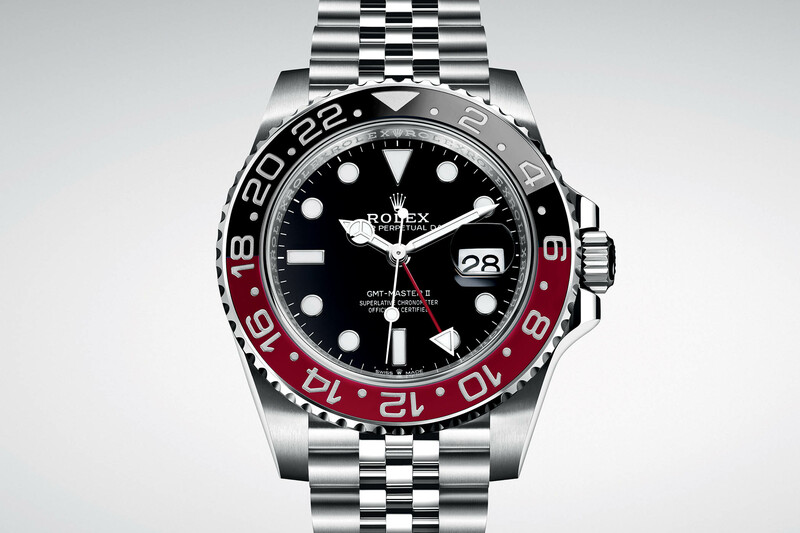 This is one that is highly anticipated by collectors – even though we hardly imagine that Rolex would ever re-introduce the GMT Coke. 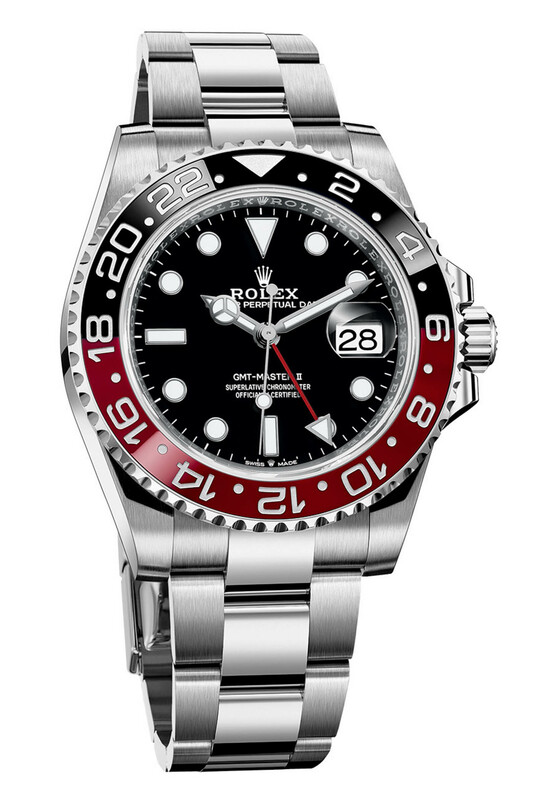 However, because our predictions are also a way for us to dream, we’ve decided to give it a try and this potential Baselworld 2019 Rolex GMT Master II Coke ref. 126710RONR is definitely a good-looking watch. It is basically an evolution of last year’s Pepsi version, this time with a black and red bezel. Why could it be introduced? 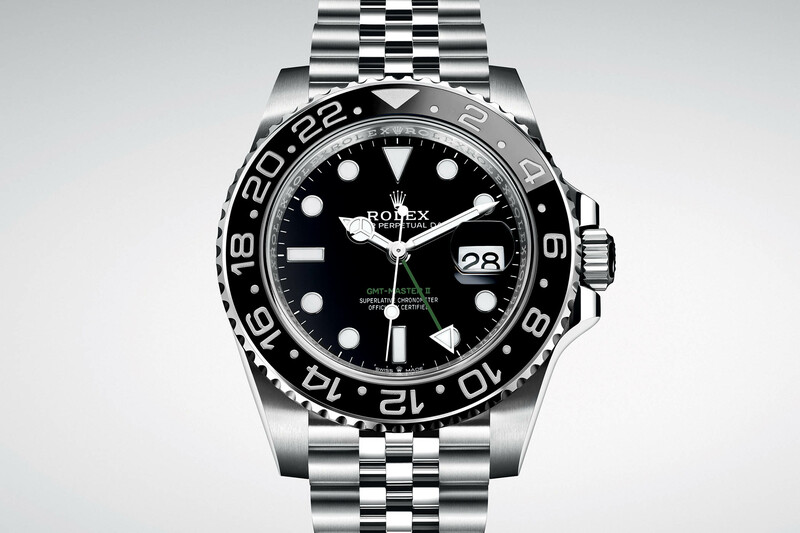 Well, we’ve read here and there rumours saying that Rolex will discontinue the Batman (black and blue) model. This would leave some space for a new bicolour version. This new model is very close to the 126710BLRO introduced last year, with the same Jubilee bracelet (we also imagined it with an Oyster bracelet), the updated calibre 3285 and the iconic Coke bezel. The main question concerns the material. We’d prefer a steel version but this new model could be the occasion for Rolex to introduce another white gold model or even a platinum version. Time will tell. Taking into account that Rolex is less predictable than it used to be and that there’s a slight vintage vibe in the current collection, we can imagine this GMT Master II Coke materialising. Following the integration of the new generation of movements into the collection, Rolex could potentially (well actually, it will – we just don’t know when) introduce an updated version of the Submariner Date at Baselworld 2019. Knowing that this watch already incorporates most of the brand’s technologies (Cerachrom bezel, Oyster bracelet with fine adjustment, etc. ), we don’t expect massive changes to the Submariner soon. The 2019 Rolex Submariner would be an update (like it was for the GMT Master II) with the implementation of the Calibre 3235. Maybe Rolex could get rid of the maxi case and offer something a bit slimmer, with more tapered lugs, like it did on the Datejust 41? Overall, small details to give the Sub a bit of modernity without altering the basic concept. As for the design itself, we’ve created three versions of the Baselworld 2019 Rolex Submariner Date. The first one is an evolution of the classic steel model – Ref. 126610LN – which only changes its mechanics. The two other versions are more creative. One is a steel model with a blue bezel – Ref. 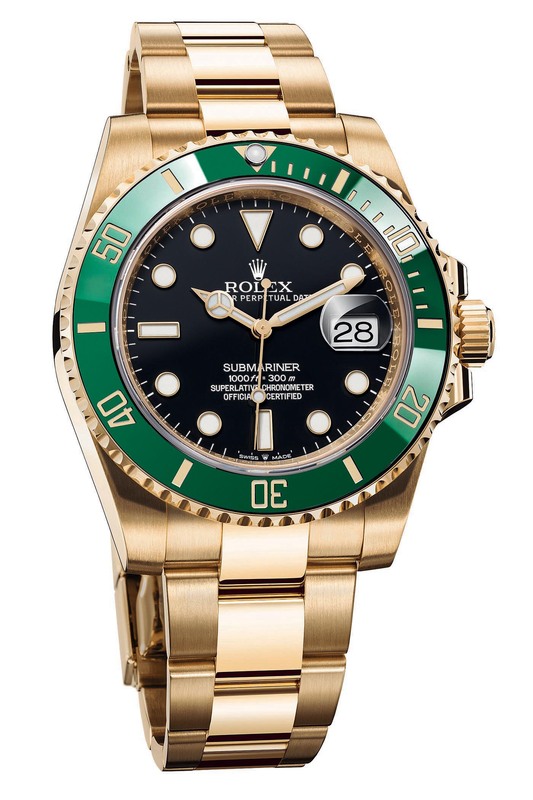 126610LB – and the other is a yellow gold version with a green bezel – ref 126618LV – a new and luxurious take on the Hulk. Although we doubt these last two versions will materialise, Rolex will certainly update the Submariner in the coming years, if not this year. Another update of the GMT Master II, which we believe is more than likely to happen. After introducing three new models (see here and here) in the collection last year, Baselworld 2019 could witness the update of the black version of the GMT, with the introduction of the ref. 126710LN. If the Batman is said to be on its last legs, we don’t expect Rolex to discontinue the black version of this watch but instead, we expect the LN to receive the same updates as the rest of the collection, meaning mainly the integration of the new calibre 3285. The rest of the watch will remain unchanged, with a black polished bezel and green accents on the dial. As much as we wish to see the option of a Jubilee bracelet, the Baselworld 2019 Rolex GMT Master II 126710LN will almost certainly be offered on the classic Oyster bracelet. Here’s a special request from our Founder, Frank Geelen, who said, “if Rolex does that, I’m buying one immediately”. And he won’t be the only one. Meet our Baselworld 2019 Rolex Explorer 1 Polar White. Nothing particularly new on this model, except a new dial, in Polar White – something that we know many fans have been asking for. It is a watch that we designed last year but we received several comments concerning the hands and the black paint inside the indexes. So for our new version of the Rolex Explorer 1 Polar White, we went classical. And the result is pretty cool indeed! What is the probability to see this watch being launched at Baselworld 2019? 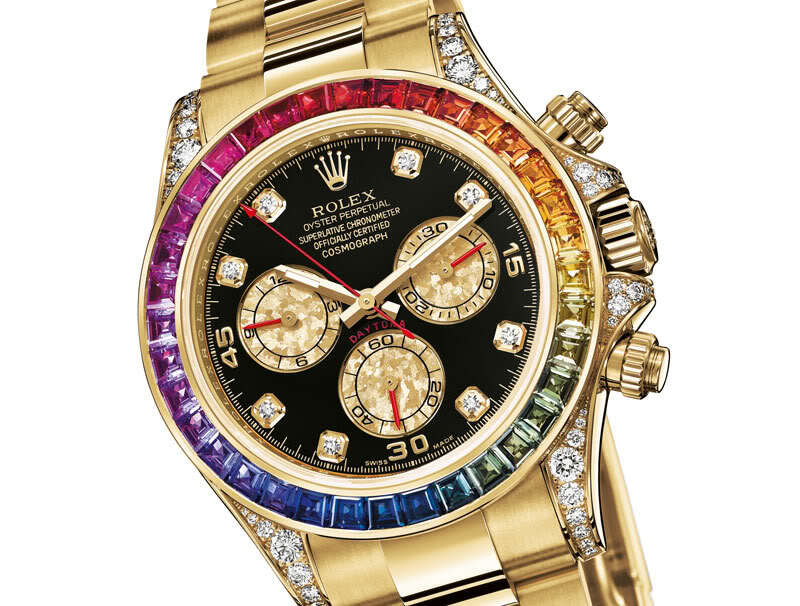 Low… But we know that the folks at Rolex read these articles! Maybe they will hear our wishes. In 2018 Rolex introduced a new version of the Datejust 36, with a new case, new dials and a new movement, the calibre 3235. 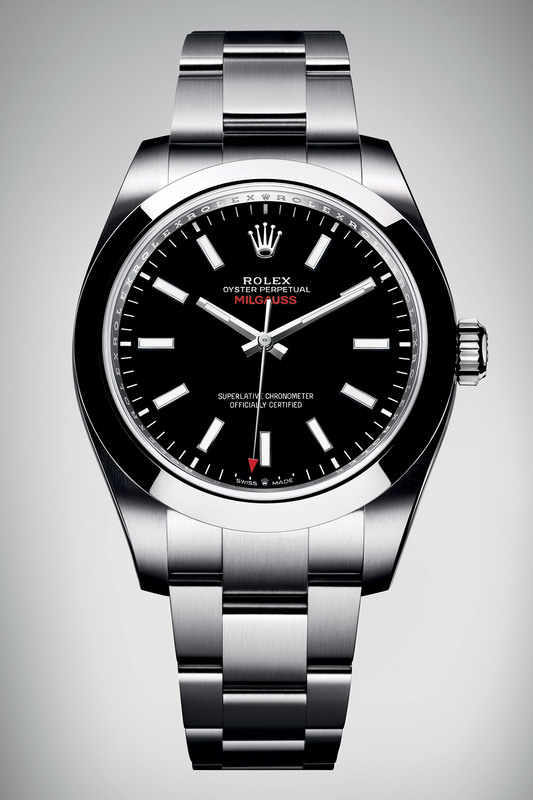 Only launched in two-tone versions, including a new Everose Rolesor combination, it seems logical for Rolex to introduce some steel versions this year (with or without the white gold fluted bezel). The Baselworld 2019 Rolex Datejust 36 Steel or Rolesor white gold will be exactly the same as the two-tone models, with a slimmer, more angular case, a thin bezel and more modern dials. Overall, not a massive update, but a logical, highly probably one. Note: this article is based on our own Photoshop mock-ups, nothing has been provided officially from Rolex. These are predictions, based on our imagination and expectations. All images are under license of MONOCHROME and should not be used without agreement or copyright (©Monochrome-Watches, 2019). 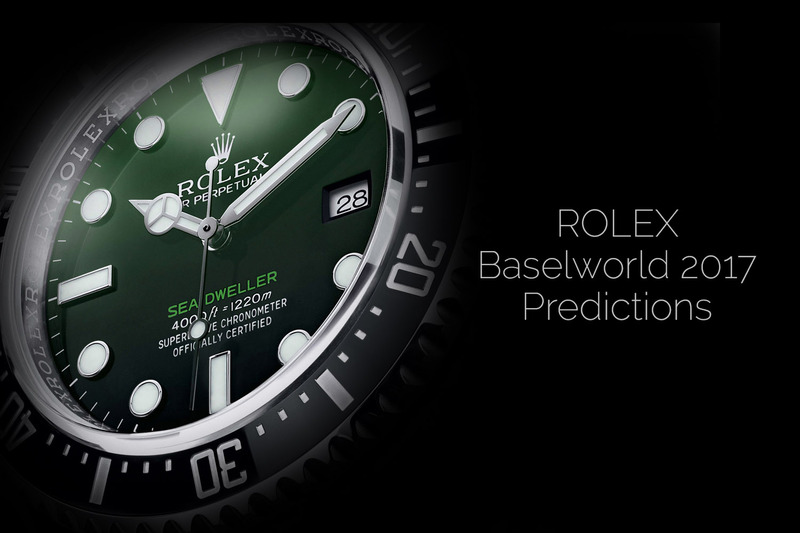 If you liked this Rolex Baselworld 2019 – Rolex Predictions 2019 article, we would love to hear your thoughts and reactions. Please use the comment box below. You can also share via our Facebook page, our Instagram account (@monochromewatches) and our Twitter page (@monochromewatch). What about a new movement in the Explorer 2 ? All the red elements of the Milgauss changed to yellow (or green) and this would be an instant legend. It will never happen, but I would like to see a slightly smaller Explorer I at 38 mm as the current 39 wears a but big for smaller wrists like mine. While there’s the classic 36 mm, I could use a smaller Explorer with updated internals. The case can also use a slight redesign so it reflects the diameter and wear size instead of just being an upscaled 36. Maybe the day-date in two tone, then in steel next year. Quelle innovation! 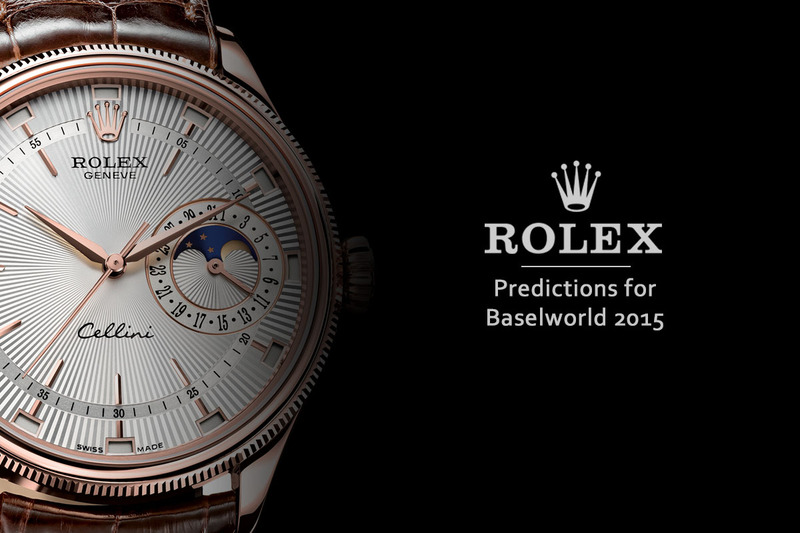 It’s always fun to see Baselworld predictions. I hope they all come true, especially the smaller Sub for the ladies and the Shark Sub. I am going to go way out on the wish list that Rolex rock the world of horology with a brand new offering, a flyback stunner that resembles nothing else in their stable. Rolex are not “slightly behind” Omega with anti-magnetic watches they have been left in the dust. Omega do not just have one or two anti-magnetic watches they produce entire ranges of them all at least 15 times more resistant to magnetism than the Milgauss and Air King. As for a wholly new anti-magnetic movement from Rolex this is not going to happen. It would require Rolex to innovate which they do not do anymore. It is depressing that Rolex seems to do no more than the bare minimum to keep buyers interested such as a few new colours here and there, an extra line of text or even the same text in a new colour. As for being able to buy any of the stainless steel Submariners, GMTmasters, Explorers etc forget it. They are harder to find than unicorns. I like the Milgauss !! as i did 2 years ago when i hoped they would release this after Artisans de Geneve did a homage for this watch ! But then `tribute` or heritage was beneath Rolex… I hope the market has teached them otherwise ! Good show ! I’d like to see a redesigned milgauss, like the one shown except with a thin rotatong bezel like the very first one had. Hey I know this is only a bit of fun and all that but I read the Rolex predictions article and my only thought was “what’s the point… if they put any of that out I won’t be able to buy it”. Since Rolex took the decision to dramatically cut supply and the only Rolex Sports watches you can buy are on the grey market at stupid mark ups whats’s the point? They are a ghost brand now. I for one am really hoping for an updated Explorer II, particularly a ceramic bezel, and perhaps even a new caliber, the one with the longer PR. It sounds though am being overly wishful. 40 days and we will know. Monochrome is wrong every year!! I wish Rolex changed the case size of the Explorer II back to 40mm. What about an Oyster Perpetual 34 with diamonds and smooth bezel??! No way would Rolex use Cal. 3235 in the predicting Submariner 36. This is because Yacht-Master 37 is using 2236 movement. 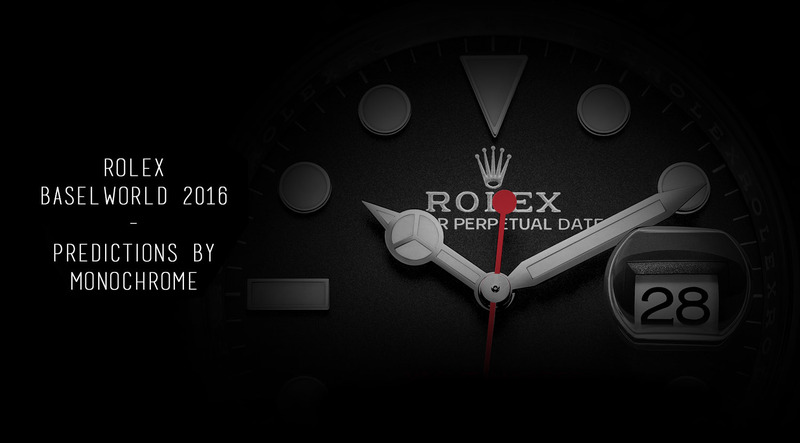 If Monochrome’s prediction is correct, then the next agenda is whether Rolex would have a caliber update of their Yacht-Master 37. Since almost nobody will be able to acquire them it remains an exercise in futility. Well done Rolex, you built your brand equity but paradoxally have become irrelevant for customers. 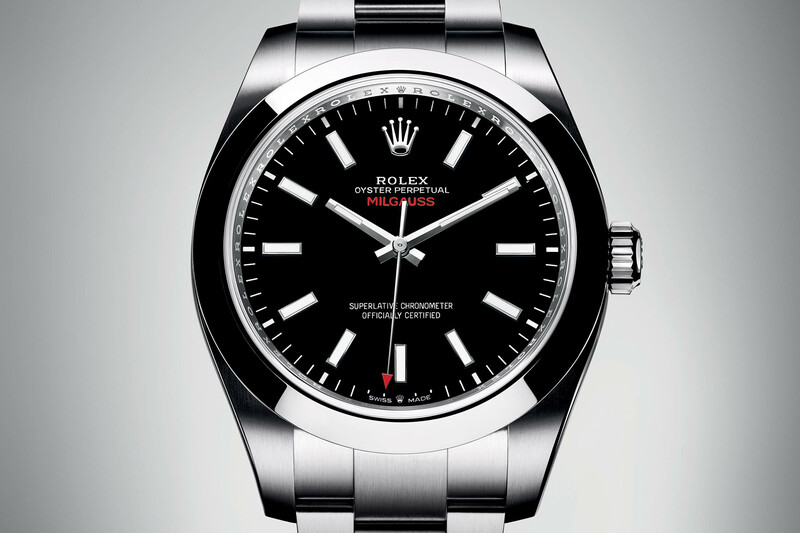 I want to see an Explorer I in 36mm with anti-reflective coatings on the crystal and totally matte dials. The “Mercedes” hands are iconic, but they are too small so a beefier design would be good. And more micro-adjustment on all bracelets. In fact, an Explorer I in 36mm with a nicely stitched leather strap would be perfect. One of the reasons I bought a Tudor rather than a Rolex (apart from the insane prices) was the re-assuring little adjustment holes on the (solid) bracelet. I thought about a datejust for 20 years or more and by the time I got round to buying one, it had to be a NOS Tudor! surely the blue Sub would be 126610LB not LV? I am partial to the original Milgauss and do not believe it needs a refresh or redesign along with the Submariner however a slimmer bezel would be welcomed since it would create more “face”. GMT with a Black and Green bezel fingers crossed. Doesn’t really matter what they release. Rolex steel sports watches are impossible to find, only the VIP and whales will have access at MSRP. Probably the most inaccurate prediction iv seen to date. Milgauss unlikely to give up thunderbolt second hand, Submariners never to feature diamonds as they are hard to sell. Black GMT wont get the jubilee strap treatment due to the pepsi. However, we will most likely see a GMT coke this year or the next. The Coke bezel looks chaotic, get in the pot if possible, just don’t fall in the trap of white gold boy. Juts making the watches relased in previosu years avaialble to buy would ne a big step! How does it work with a waiting list if a new model arrives. Can you just go to a official retailer when it launches to be one of the first on the list ? It would be nice if you could actually buy some of these. I’ve been trying for over a year. Explorer II gets a slight face lift including a Ceramic bezel in a metallic finish and correction to the matt black masking on the hands, plus a full length orange 24 hr hand on the black dial version like the white dial. Plus the new movement. Rolex likely to announce emerging themselves from availability towards more investment sought instrument causing increase of overall pricing and longer waiting list for the utterly desired models. It will also cause auctions emission of a long term held heritage models and others diversed in public, seeming expectably natural for a decades long cycle in watchmaking tradition and managerial decisions undertaken on behalf. Given enormous interest for the watches in asian and american markets it is not a surprising move for the company to advance together with and among principally Patek and Audemars setting up as a decades verified quality, high profile fashion and social status recognition improvin watchmaker. I love this time of year when we wait excitedly for new Rolex watches to be introduced at BaselWorld. I share your frustrations knowing that trying to buy these new releases is like winning the lottery. Having said that I have my name on a authorised dealers list for the GMT Pepsi and hopefully I will get that phone call sooner than later. My humble prediction is that the Submariner date and no date will get the amazing 3235 calibre and beyond that I have no clue. 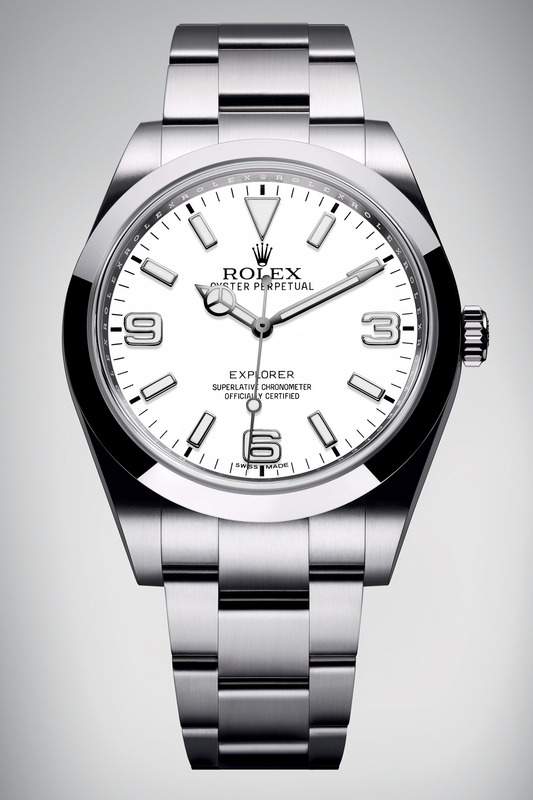 What would also be great if the Explorer 2 receives a ceramic bezel and the new 3286 calibre. One final comment the Milgauss is conservatively rated by Rolex as having 1000 Gauss resistance to magnetism I have read tests where it can resist at least 4 times the advertised level of resistance to magnetism. Unlike Omega , Rolex does not try to sell its watches primarily on the unrealistic , impractical high resistance to magnetism. I have owned my fair share of Omegas and a couple of Rolex watches and I have to say speaking from my experience both brands are great but the Rolex watches are one or two levels above in accuracy, reliability and overall quality . For your hard earned coin that you outlay on a Rolex (precious metals and diamonds aside which in my opinion are not necessary) there is no better value elsewhere. No I am not affiliated in any way with Rolex I just love Rolex watches.